A Funny Old Bird, 1998 -- A Funny Old Bird celebrates the survival of character, family and neighborhood in the face of the conforming forces of contemporary American culture. A Serviceman arrives at the door of the Dupelle residence to "groom" the family parakeet. It soon becomes clear, however, that the Serviceman has been sent for more serious purposes than the grooming of a small bird. 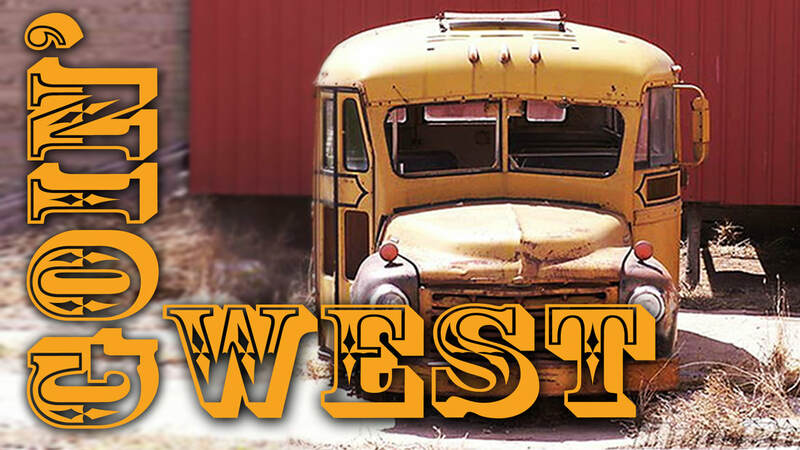 Goin' West, 1987 and (revival) 2018 -- An abandoned school bus sets the stage for a 21st century cross-country mythical adventure of the imagination. In this absurd comedy, featuring a tortuous “pant-horn”, the Chairman of The School of Landscape Architecture gives an introductory lecture on how to be a “professional”. Arguing that it’s “appearance” not expertise that makes one a “professional”, the Professors in attendance (dressed in too-tight light blue polyester suits) nod in agreement. The goal: choose a suit that is so restrictive as to incapacitate the wearer—a suit that states unequivocally that its wearer performs a function so inconceivably important that he or she can’t be bothered with trivialities. Herein again lies the Paradox of Professionalism: it’s not so much what you can do that matters, but what you can’t do. “An Evening of Good Clean Fun” featured some of The Fabulous Giggin’ Brothers’ early comedy works, and included: the short play “The Paradox of Professionalism”; video performances “Willy Do My Pigs”, “Stalkers”, and “The Pedestrian”; and the live music of “Bush Rookie and The Plywood Bellbottom’s”. Mike's NYC premier with The Fabulous Giggin' Bros' featuring two short absurd plays written by Mike, Biffing Mussels and Conversation Pieces, and a third, A Random Act of Violence, co-written with his brother. Written by Michael Gorman & William Gorman. Two rabbits move in next door to Bob Jones, a United States Postal Service worker, whose hand has been disfigured on the job. The rabbits keep up a cynical running commentary on the depressing state of Bob's life as they follow him to work one day where he is promptly fired by his boss who gleefully claims that he "has a reputation to uphold of pushing otherwise normal people into committing unspeakable acts of desperation." Bob goes on a rampage, shooting 19 people, only to be acquitted of all charges following a brilliant courtroom argument for, and demonstration of, the randomness of Bob's actions by the rabbits, turned Defense Attorney and star witness.